Last night the stars aligned, and Boyfriend and I both had the same day off. It’s a provincial holiday, so we stayed indoors, playing video games and cooking. He made dinner and I made dessert. 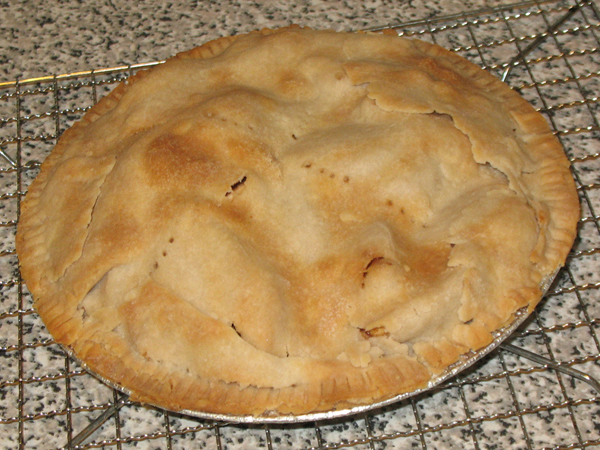 This is my first pie where dreaded Frankencrust did not appear. Tah-dah! It looks much better than all my previous pies. Am so happy! I love pie. I don’t post pie recipes, because mine are very often disappointing. It seems like I’m not the best person to give advice on how to make a pie, if my own are not up to the exacting standards I want (basically, to make a pie like my older sister makes). Whoa, that is a lot of liquid. Not sure what happened there. C’est la vie. I haven’t been baking very much this month. Too busy immersed in Skyrim and the glorious side quests. Overall I’m having a very lazy extended weekend and if you’ll excuse me, I have a book to read! 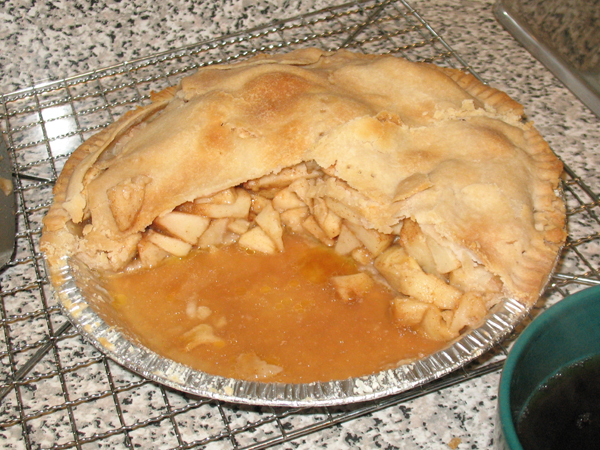 This entry was posted in pastry and tagged apple pie, books, boyfriend, food, older sister 3, recipes, video games. Looks like very tasty pie. 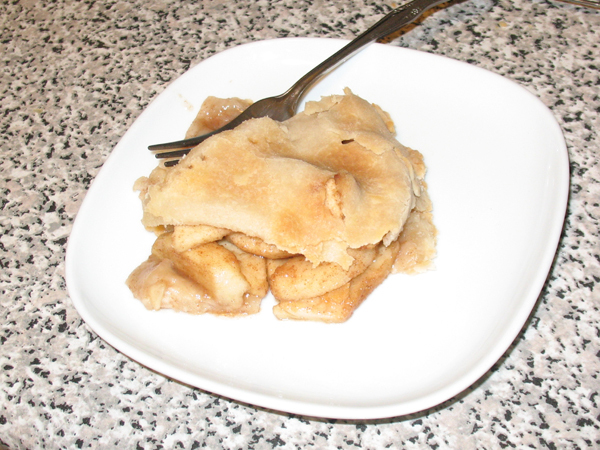 The amount of liquid may can depend on what kind of apple you used (spy apples are the best if you can find them) but also means you needed more flour tossed with your apples before putting them in the crust. I also learned a few tricks at school, if you are interested. Also, if you need volunteers to help tests your pies, I am willing to endure experimental pies for the sake of prosperity and give you my opinions between mouthfuls. Boyfriend’s parents also suggest Spy apples but I have never seen them for sale. Where do you find them? Ah, excellent! I will keep your pie volunteering in mind the next time I’m over.